A native of Colorado Springs, Maddie is an undergraduate at the University of Maryland pursuing a degree in civil engineering with a focus on water resources and environmental engineering. Through Engineers Without Borders she has worked on bio-retention projects, and currently she is helping to design a water distribution system for a community in Nicaragua. 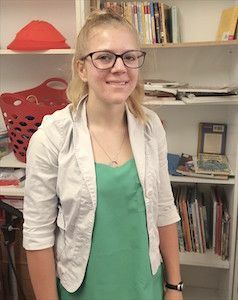 Maddie enjoys working with students of different age levels at FCS and says she has been inspired by the way our middle-schoolers talk about their hopes and dreams. A Navy ROTC student, Maddie will work for the Navy after graduation; she hopes to focus on disaster relief efforts or help assess the stability of nuclear power plants.